Mobility is one of the reasons why many are jumping on the freelancing bandwagon. You don't have to commute to work to earn a living. You can work as a freelancer from the comfort of your own home, in your favorite coffee shop, or in a co-working space. Indeed, our ability to do things on the go has made an enormous impact not just on how we do business, but also our daily life. One study published by Statista shows that over half of the internet traffic from all over the world come from mobile devices. Of these, 77% use their mobile devices to search on the internet even if they got a laptop or desktop on hand to use. Because of these changes, Google recently began rolling out its latest search algorithm update. They aptly called it mobile-first indexing. As its name implies, mobile-first indexing means that from now on, Google's search algorithm will regard the mobile version of your website as its primary version, not your desktop. Now, that doesn't mean that Google won't anymore consider your website's desktop version. It will still consider your site's desktop version. However, it won't get as high a ranking on Google's search results page compared to those optimized for mobile-first indexing. 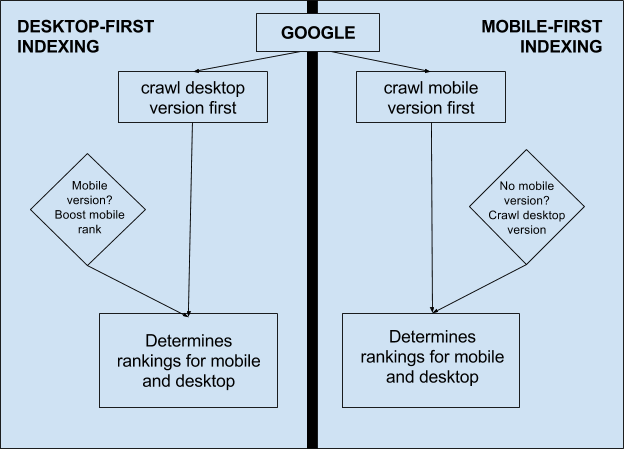 For many, that’s the question that many are asking when Google announced the news about mobile-first indexing. To answer that, we need to learn a little bit about search engine optimization first. Search Engine Optimization, or SEO, is a system that’s meant to increase the visibility of whatever you publish online so that it gets more traffic. Whenever someone searches Google, it sends out robots called web crawlers or spiders, to scan and catalog all the different files published online. These are then evaluated by Google's algorithm, which then displays and ranks them based on their value and relevance. Why should freelancers care about mobile-first indexing? Aside from the fact that SEO is one of the crucial skills freelancers must have today, the freelance industry is on the rise. In the US alone, over 57 million people are working as freelancers, and this number is growing. In fact, it's estimated that freelancers will dominate the US workforce within a few short years. That’s a lot of competition regardless of your niche and service! On top of that, studies show that websites or online portfolios that are listed number 1 on Google's Search Results Page (SERP) are the ones that most people tend to click.